Today we’re going to talk about Weight Distributing Hitch Systems, how they work and the different types of systems. These systems are a bridge that connects the towing vehicle and the trailer. It has an adjustable under truss system called spring bars that join the “V” of the trailer to the hitch head and the receiver hitch to distribute the weight evenly. The head bolts on to the shank to make sure that you’ve got the proper height and the shank slides into the receiver hitch which is bolted to the towing vehicle. This allows the weight to distribute evenly between both axles of the towing vehicle and the trailer. 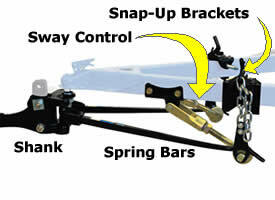 Kits That Include Sway Control: This system is by far and away the best setup. It gives a driver good control at an affordable cost. The Reese Strait-Line series includes dual cam sway control to stop trailer sway before it begins and a high performance Weight Distribution System (WD) that all comes in one kit. It’s available in a trunnion bar WD kit with shanks or a Round Bar WD kit with shanks. There is also a Pro Series SC model which incorporates a built in friction sway control. You can check out this product here. These systems are affordable and easy to install and give maximum control. Heavy Duty Weight Distribution: These heavy duty kits can handle a heavier Gross Trailer Weight and come in both Trunnion Style with a GTW of 6,000 – 17,000 lbs or a Round Bar Style with a GTW of 6,000 – 12,000 lbs. Light Duty Weight Distribution: These light duty systems a good for lighter loads with a GTW of 3,500 – 5,000 lbs. Trunnion bars: Trunnion Spring Bars are tapers for strength and flexibility to create a smoother ride over uneven roads. Many would argue that this system is superior over the round bar style as they are easy to remove and install in the head and because there is no bend in them they are considered stronger. Round Bars: This weight distribution system uses a round bar spring. Many feel that this system is easier to use as you need only adjust them once if you are using the same trailer. This is a good introduction to Weight Distributing Hitches and the styles available. We’ve got a huge selection with descriptions, weight capacities and all the details you’ll need to make an informed decision when considering this system. Check out our selection here or give one of us a call at 877-509-0719. We’ve pretty much answered every Weight Distributing Hitch question every asked.